2 Open 7 days a week! Welcome to the April/May issue of The Boldmere Pages, packed full of local events and activities to keep all the family entertained. 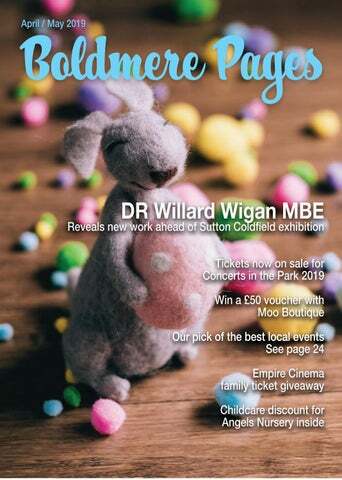 This issue find out more about Moo Boutique Boldmere and win a £50 voucher to spend in store, see the new artwork by micro-sculptor Willard Wigan MBE ahead of his April exhibition at Sutton Town Hall, plus we have all the details you need for this year’s Concerts in the Park event. Don’t forget to enter our competition to win a family ticket to Empire Sutton Coldfield and if you have any feedback or suggestions, we would love to hear from you. WIN A £50 VOUCHER! To celebrate the opening of Moo Boutique, enter our competition to win a £50 voucher to spend in store. Simply email your contact details to boldmerepages@outlook.com with the subject line ‘Moo Boutique Competition’. A winner will be drawn at random on 1st June. Time to say goodbye... After three years as Editor of the Boldmere Pages, I am sad to announce that this will be my last issue and the very capable Robin Gray will be taking over from June. This is not a decision I have made easily as I have loved being a part of the community and helping to promote the wonderful businesses we have on our doorstep. I have a young family and I feel like it is time to focus on them for a while. I know, however, that the magazine will be in very capable hands. Robin has plans to develop it further by making some exciting changes over the coming months. A well known member of the local community, Robin is experienced in all aspects of media and runs his own media company. Heâ&#x20AC;&#x2122;s excited to bring the Boldmere Pages into the Gray Jones Media fold. 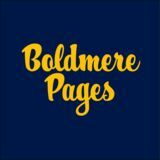 Finally, I just want to say a big thank you to all the businesses and readers, who have helped make the Boldmere Pages a success, it really has been a pleasure. We all have a superhero inside us, it just takes a bit of magic to bring it out. In Billy Batson’s case, by shouting out one word - SHAZAM! this streetwise 14-year-old foster kid can turn into the adult superhero Shazam. An epic musical fantasy about the uncensored human story of Sir Elton John’s breakthrough years, starring Taron Egerton, Jamie Bell, Richard Madden and Bryce Dallas Howard. Concerts in the Park is back for 2019! Royal Sutton Coldfield Town Council has announced this summer’s dates for Concerts in the Park. The event will once again take place in the beautiful surroundings of Sutton Park, on Saturday 29 and Sunday 30 June. This will be the third year the event has taken place, with 8,500 people enjoying last year’s programme. The world class City of Birmingham Symphony Orchestra will headline the Saturday night concert with a programme of popular classics, music from the movies and Prom favourites. The orchestra will be conducted by CBSO Associate Conductor Michael Seal and UK swing act The Jive Aces are confirmed as the support group. Further acts and the evening’s compere will be confirmed later in the spring. Note: You can alternatively make this a chocolate and pear cake by substituting 75g of flour with cocoa. Read the April-May 2019 issue of the Boldmere Pages, Boldmere's favourite magazine!